"Community health centers", "Health IT", "beyond insurance series", "electronic medical records", "health care costs", "health care reform", "health insurance reform", "health reform", "hospital costs"
There's been a lot of grumbling on the current health care legislation - and there are bound to be. As President Obama often says, if health reform were easy, it'd already have been done. But it's not. Nonetheless, Congress is poised to make history by finally passing health reform this week, and it is important to understand what it means for all of us. 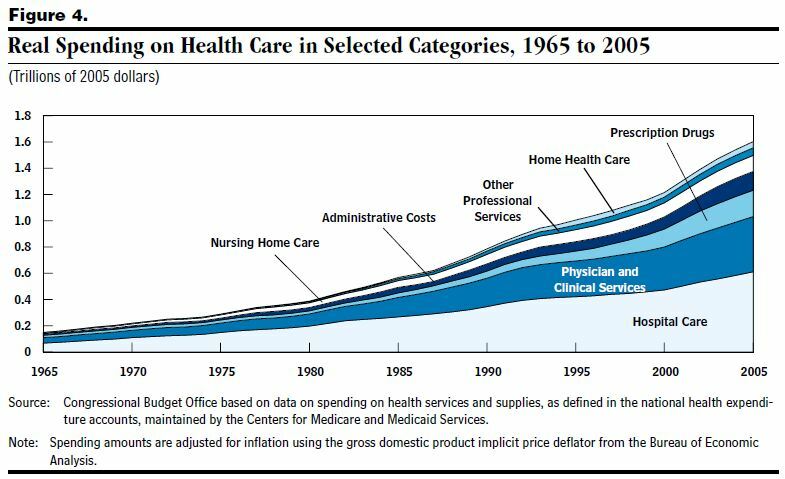 As you can see, the biggest chunks of our health care costs are taken up by two major factors: hospital care and physician and clinical services. Another skyrocketing costs recently have been the cost of prescription drugs, and nursing home care and administrative costs seem to be jockeying for a fourth place medal. So today, I start a series to look into the cost measures in the current health reform legislation - not just with health insurance but with health care. Today, we will look at three things: bargaining by insurance, community health centers, and electronic medical records. In order to effectively bring costs under control, a comprehensive health reform package needs to address all of these areas. There are direct ways to reduce those costs, as well as indirect ones. Whoa! Did you see that? The same insurance company in the same state pays one hospital $1,800 for an appendectomy while paying another one almost eight times as much, $13,700? What is the rhyme or reason behind this? There isn't any, except that with hospital industry consolidation, hospitals don't have much competition, and with insurance company deregulation, they don't have much of an incentive to negotiate down the price. When health reform is implemented, your insurance company will not be able to drop you or increase your rates when you get sick, refuse to accept you into a new plan because you are sick, and they will not be able to make you pay unlimited out-of-pocket expenses. So how do they make money? By negotiating with providers and hospitals, and bringing down the cost. Obviously, there is no reason why they have to pay different hospitals ridiculously different amounts. Here's a real public option in health care. The President's proposal invests $11 billion in Community Health Centers over five years. The Senate bill invests a total of $8.5 billion over the next 5 years in services ($7 billion) and construction (1.5 billion), and the House bill approves $12 billion over the same period. One might ask, then, why Sen. Sanders' office was reporting a $10 billion funding in the Senate bill and a $14 billion funding in the House bill. According to the actual texts of the Senate bill and the House bill here is how funds are distributed: the parts the president's proposal quotes are correct - for the CHC's themselves. The remaining amounts, $1.5 billion in the Senate bill and $2.5 billion in the House bill, are to fund the National Health Service Corps over the same 5 years (fiscal years 2011 to 2015). Given that the Senate bill is now the underlying bill, it is safe to assume that the Senate bill's $1.5 billion additional funding for the National Health Service Corps remains intact. That is a total of $13.5 billion related to community health centers. As Sen. Sanders said, the House bill's $14 billion funding would deliver actual health care 45 million people. Adjusting that number to $13.5 billion, we have over 43 million people that will be able to be served by the Community Health Centers by 2015. Why am I making to read through all these numbers? Because the Senate bill is expected to lower the number of uninsured to 23 million - and with the President's proposal and higher subsidies in reconciliation - likely even lower. So, as you can see, for the first time in American history, Community Health Centers will be able to serve almost twice as many people as will be uninsured. What does that have to do with competition? Right now, Community Health Centers are not well concentrated everywhere in the country. These, remember, are the baselines - CHC's are able to leverage federal dollars on a one-to-five ratio with private dollars. This means for the first time, we are going to be able to put community health centers in real competition with private providers and hospitals. What will big hospitals and large Medical businesses (not family practitioners, who already charge reasonable rates) do when there's a CHC right around the corner? Of course, Community Health Centers are meant to be primary health care providers. This is direct competition to for-profit primary care providers, but even more importantly, the vast amount of people that will be able to get services from CHCs in this expansion will mean vastly improved health, early diagnoses of both actual diseases and risk factors, and treatments in early stages. What does that add up to in a lifetime? A lot less in hospital bills for individuals and a lot less in hospital related expenses for our economy. Add it all up and it's a total of - are you ready for this - $297.4 billion in savings, almost $300 billion in reduced costs and savings each year. And the savings are real - health plans that have switched to electronic prescription records report millions of dollars in savings just by being able to more easily find generic alternatives to expensive brand name medication. This is serious downward pressure on the health care cost curve in this country. This gives us an idea on savings and cost measures in just three areas that we need to go after. I hope this article has been helpful to you to understand these various cost measures. In the coming days there will be at least two more in this series focused on: (1) nursing home vs home health care and the cost savings therein, primary care (which I alluded to today) savings paired with prescription (generic) drug savings, and (2) excise tax and administrative costs. Please stay tuned. Mar 13 How do you know AHIP is lying?